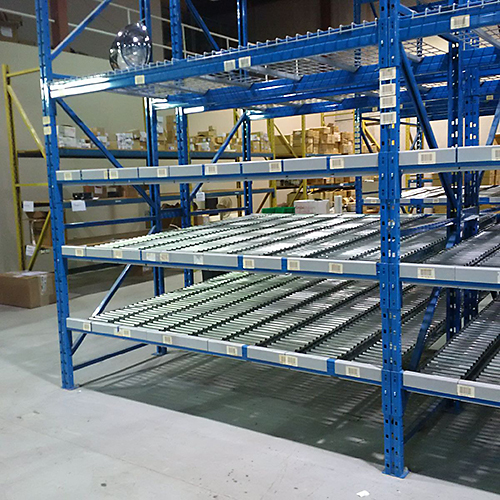 Carton Flow – Canadian Rack Inc.
Canadian Rack is an exclusive distributor for Span-Track®. Span-Track® full-width roller, carton flow track (also known as case flow track) can be added to any new or existing pallet rack system – no shelves or intermediate supports are required. Tracks can easily be picked up and moved or rearranged by hand to suit your individual SKU’s. The beauty of Span-Track® is its simplicity and versatility. These full-width flow tracks are extremely robust and durable, allowing loading capacities of up to 50lbs/sq.ft. while also providing outstanding real world abuse resistance. The full-width ¾” diameter rollers are made from tempered aluminum and spin on full length 3/16″ diameter steel axles. The roller/axle assemblies are fixed to galvanized steel support channels helping provide a remarkably efficient yet cost-effective carton flow product. The full-width rollers provide evenly distributed contact with the carton eliminating hang-ups and as a result provide great product flow throughout your system. Span-Track® fits into new or existing rack structures.